Google Reader’s settings page has a new section where you’ll find “experiments you can choose to opt-in and try out”. It’s like a small Google Reader Labs that only has a single experiment you can enable: smooth scrolling. This feature makes the transition between items smoother and it’s especially useful in the expanded view. While this feature is more difficult to find, you’ve probably noticed the colorful ball that’s displayed when Google Reader loads new posts. The animation is one of the few colorful elements from the new Google Reader interface. 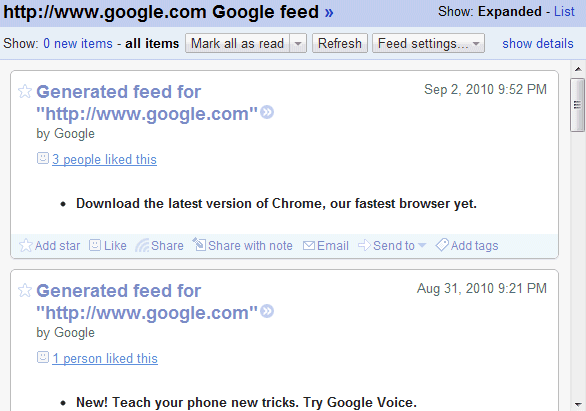 Google Reader users probably noticed that the feed reader has been replaced by Google Sites in the main navigation bar. To visit Google Reader, they need to click “More” and then click “Reader” in the list of Google services. Unlike the last time when Reader was replaced by Google Sites, this time is not an accident. A Google employee explained that this is a permanent change. While the link to Reader has moved, you can continue to access Google Reader under the “More” dropdown. Or, you can also set a specific bookmark to reader.google.com for one-click access. Depending your browser, try dragging http://reader.google.com right from this post onto the bookmark bar on your browser (usually below the URL bar). Google has usually made changes in the navigation based on the popularity of the services and it’s likely that Reader’s popularity is declining, while Google Sites gains more users. According to Google Trends, the queries [google reader] and [google sites] have almost the same search volume in the US. 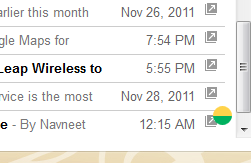 Like Picasa Web Albums, Google Reader doesn’t have a new interface based on Google+. The latest features added to Google Reader were comment moderation and integration with Google Buzz, a service that will soon disappear. Google Reader’s blog announced that the feed generator for pages that don’t have feeds will no longer be available starting from September 30. Google says that not many people used this feature, which is not surprising, considering that it’s quite difficult to find it. Unfortunately, Google Reader’s feeds looked terrible. The title for each item was “generated feed for [URL]”, the feature didn’t detect new images and the feeds were updated when the new versions of the pages were added to Google’s search index. Here’s Google Reader’s feed for google.com and here are the changes found by Page2RSS. Page2RSS found 8 changes in September, while Google only found one. Page2RSS has another important advantage: the service constantly monitors web pages and it’s not tied to a search engine that indexes billions of web pages. If you don’t like Google Reader’s interface, there are desktop apps like FeedDemon, NetNewsWire or Liferea that import your Google Reader subscriptions and synchronize your actions with Google Reader. That means you could share a blog post in FeedDemon and someone could post a comment from Google Buzz or from an application that uses Google Buzz API. 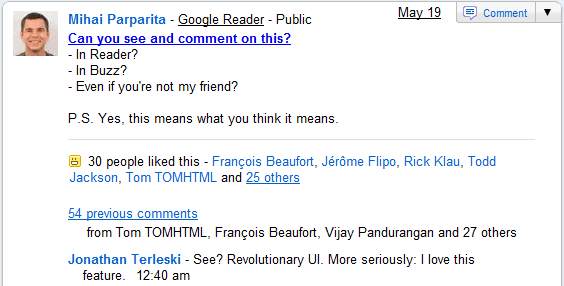 While people can post comments to a Google Reader shared item in Google Buzz, you’ll still see the comments in Google Reader. It’s not really important where you find a great article and where you comment. 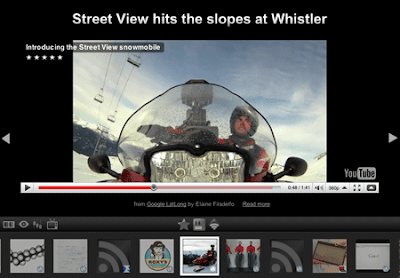 Google’s feed reader started to support the video and audio tags from feeds. The only popular browser that doesn’t support the two tags is Internet Explorer, but that doesn’t mean that you’ll be able to play videos without plug-ins in all the other browsers. As the screenshot below shows, Firefox and Opera don’t support the H.264 compression standard, so you can’t play videos from sites that only use H.264. Even if video sites like YouTube or Vimeo started to test HTML5 players, they don’t offer the option to embed videos using HTML5 tags. Items in Reader Play are presented one at a time, and images and videos are automatically enlarged to maximize the viewing experience. We use the technology behind Recommended Items in Reader to populate Reader Play with the most interesting content on the web. While you don’t need a Google account to use Reader Play, your experience will be personalized if you sign in. As you browse, you can let us know which items you enjoy by clicking the “like” button, and we’ll use that info to show you other content we think you’ll enjoy.